Gift cards are valid at all of our restaurants and hotels. Enjoy creative comfort foods with traditional and modern versions of classic dishes popular in European and French Bistros, along with wonderful wine selection with many by the glass. 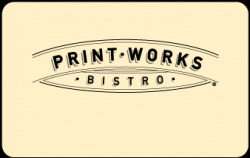 Print Works Bistro is located adjacent to Proximity Hotel in Greensboro, NC. See full menus and photos of our featured items and favorites at printworksbistro.com.